Cyclists in the City: Why do London's Cycle Superhighways cost at least 10x more per mile than the considerably superior Chicago cycle superhighway? Why do London's Cycle Superhighways cost at least 10x more per mile than the considerably superior Chicago cycle superhighway? If you click on this link, you can hear Kulveer Ranger , the Mayor's Environment Director talking about London's Cycle Super Highways. Among other things, he identifies that the biggest danger to cyclists in London comes from HGVs. His solution? Training for cyclists and HGV drivers. As I pointed out yesterday, Holland's Road Safety Institute feels that's not really the answer: "The ultimate solution for the blind spot problem is a structural separation of trucks and cyclists." Ranger also describes how the Cycle Super Highways 'were actually designed with input from cyclists'. Yes, that's correct. Input that was consistently ignored. Such as at Bow roundabout where the London Cycling Campaign and TfL super highway teams on the ground agreed a design that would have ensured a structural separation of trucks and cyclists. You can see the scheme that the London Cycling Campaign thought had been agreed here. Someone at TfL overrode that original plan. Two people were killed cycling here on the revised layout last year. But the same is true of all the super highways. Yes, cyclists were asked for input. Again and again, though, that input has been ignored or overriden. Ranger continues and says that cyclists asked for 'continuous, direct routes on the main roads' and that the blue paint 'isn't just blue paint'. Apparently, the paint is designed to tell motorists 'where they could expect those cyclists to be'. Pictured above, cycle super highway 7 in Clapham. Cyclists are meant to be following the blue paint. I'd argue that the blue paint here isn't much help to either people in cars or on bikes. And here comes the clincher. How much have these things cost? Kulveer Ranger proudly says the routes have cost between £10-20 million each. The four routes are, respectively, 2.7, 5.1, 5.7 and 7.2 miles long. At a rough average of 5 miles each then, London's cycle super highways cost between £2 - 4 million per mile. And they are either pieces of infrastructure that were already there five years ago or, just when you actually need them to keep you safe, nothing more than blue paint, like the picture above. Interestingly, Chicago recently launched one of its new cycle super highways. According to the Chicago Tribune: Cyclists are buffered from traffic along the half-mile stretch by plastic posts and a car parking lane. The project cost about $140,000. In other words, Chicgo's cycle super highway costs around £175,000 per mile. Why on earth do London's Cycle Super Highways cost at least 10x that, between £2-4 million per mile, if Kulveer Ranger's statement is correct? And what's more, just look at the superior quality of the Chicago bike lane. 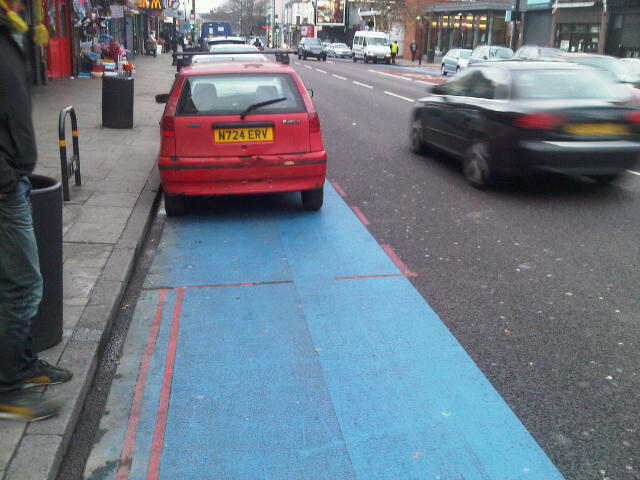 In London, you get blue paint that leads you directly into a car parking space. In Chicago, they've moved the car parking over to give space to people on bikes, separated bikes from the main traffic flow, provided separate lights so there is minimal conflict between motor drivers and people on bikes at junctions. Look at the enthusiam displayed by Chicago bike users for their new cycle super highway and compare with the sheer anger and incredulity felt by Londoners at the way Boris Johnson's 'cycling revolution' is being mismanaged by Transport for London. The only revolution we're seeing in London is that Londoners are revolting against Transport for London. What a wasted opportunity to get this right the first time and at a ridiculously high cost. I can only vouch for my corner of London but many of our streets are the same width as those in Chicago. Bow Road for example contains six lanes of traffic, on-road parking and two very wide pavements. Where the road becomes Stratford High Street it widens further and a central reservation appears. Regarding the cost, that will be swallowed up by engineering consultants who generate CRISP (Cycle Route Implementation and Stakeholder Plan) reports and the like. Bill G is half right. Substantial proportions of the budget get spent on consultants, but also, in the City of London at least, a substantial proportion is also eaten up by City staff costs. Quite why it should involve so much City input, why TfL grant money should be raided this way, or why the wealthiest borough in London can’t pay its own staff costs, has never been satisfactorily explained. At any rate, entire years’ worth of TfL grant money has been spent by the city on studies without a shovelful of tarmac or concrete being shifted. One year, the entire grant was spent on the Southwark Bridge lane barriers, introduced not for cyclists (that was just an afterthought) but to prevent coaches parking on the bridge. I have heard that cycle lanes cost an average £250k per km to build, including cost of land purchase. Chicago sounds cheap, although presumably the land was already owned. I can’t imagine why the “super”highways are so costly – it surely can’t be the paint, as that must have been provided free by Berklay’s Bank, being surplus to requirements for painting their reduced local branch network! Ps: Danny – can you look at Wordpress? Blogger really is a pile of shite. 49% Mode Share? Did I hear that right? Watching that video makes me want to weep for what we have in this city. As I have heard, the LCN+ cost somewhere between £150m - £200m. When I asked someone at TfL if he could identify even a single example of it working well, I had the phone put down on me. Significantly the boroughs would not need planning permission to develop a comprehensive, city-wide cycle network to a mínimum level of functioning. I readily concede that the development of such a network will do little to inspire new cyclists, but can anybody else suggest a more fruitful first step? Same old same old. If it can be expensively fucked up there's nowhere better to get it fucked up than good old Blighty. I despair. Don't they have a similar thing in Brighton? I was asked for my opinion on the CS7 by the project manager. We had a chat and a cycle on it together but he didn't really listen to the points I was making. What strikes me from the film is that the bike lanes are clearly designed for cyclists trying to get somewhere, i.e. going reasonably fast. In Britain, even on the best bike routes we can't build them without putting in some sort of obstruction every few yards. You don't have to go so far as Chicago to find much better value for money. Over on the other side of the North Sea the costings are much lower than in London for much better quality than in Chicago. However when this work was done, no press-releases or movies were sent out, because this was just normal here. Considering the size of the contract, I take it the construction of the London Cycle "Superhighways" has gone through the process of the obligatory European call for tenders? So how did you guys get from there to painting parking lanes blue for millions of euros? I had a taxi driver carefully slow down to explain to me that as there was no white line along the side of the cycle superhighway on Clapham Road, he was in fact perfectly entitled to drive in it. He advised me to "read my highway code". It seems to do anything here you first have to find a consultant (or several) and the more absurd their fees, the better they are. You then give them a vast timespan to compile a report, hoping they'll ignore any similar research done previously. If all goes to plan the report arrives too close to an election to justify doing anything... London's roads could easily receive the Chicago treatment, cut two traffic lanes down to one, lose bus lanes, oh and lose the parking! "oh but the buses will be held up" they cry, no they won't as a good number of the motorists will see how safer and faster it is by bike and switch, easing congestion and everybody wins. There, that'll be £1000 please! Great sharing. Book meet and greet at Heathrow and save now. Interesting post. Checkout cheap Luton airport parking.